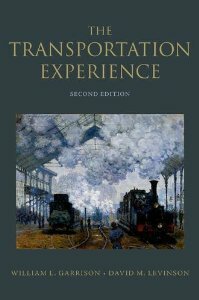 The new version of The Transportation Experience describes the history of transportation across several five to six decade long waves. While the periods are straightforward (though somewhat arbitrary, as would be any periodization of social trends), there is some subjectivity in the dominant technology with which to characterize them. Certainly the first period is an age of Steam, and the second period is the dawning of electrification (the birth of the streetcar, as well as electric utilities, the telegraph and telephone), while the third sees the rise of the Internal Combustion Engine and motorization in all its forms. The fourth wave does not have as its center a new propulsion technology, but instead is more about reorganization. In freight this is the logistics (containerization) revolution. In roads, it sees the deployment of limited access road networks, aiding freight logistics of course, but also reshaping cities. It also sees the beginnings of deregulation (airlines, railroads, trucking, energy, telecommunications) and continuance of rationalization and consolidation in the mature modes. Now in modern (or should we say “post-modern”) times (in the developed countries) the freeways are built and we may have peak car and peak road, if not peak travel overall. So instead of describing what post-modern transportation should be, let’s describe what it is. It seems the post-modern era (like eras before it) is about doing the same things more efficiently (i.e with less input resources of time, money, energy, safety, clean air) (which are easy to spot), as well as some new things (which are harder). Perhaps most importantly, it is about doing fewer things with transportation when transportation is not required. This doesn’t mean no transportation of course, so long as we avoid the Matrix, we will need to move physically not at least some of the time. But if we use less transportation, we also use transportation differently. Renting (sharing) becomes a more viable option. Riding transit occasionally rather than storing a car always is more cost-effective. Thus, the price we face begins to be a marginal cost (for vehicle ownership) rather than an average cost. The things which transportation does are connect people and places. We often say transport is a derived demand, meaning we travel to do something else, not for the sake of travel. So doing the same thing does not necessarily mean using the same modes in the same amount. Cars had been getting heavier, but that seems to have peaked. Paved road centerline miles may have peaked. Cars are more electric, and hybrids are now at 4.2% market share in the US. There are fewer cars dealers. Cars and bikes are rented more. We don’t go as far or as often. We substitute telecommunications for some out-of-home activities like working or shopping. Mobile internet enabled mobility options like Uber and Lyft exist and are growing rapidly. Interstate toll road mileage is up about 17% in the past decade, non-interstate is up 12%. Congestion is down over the decade. Rose colored glasses or Green eyeshades? So from my perspective these longer-term (decadal) trends are in the right direction. Still, the outcomes are not where we want them to be (since the logical (cost-independent) goals are Zero Emissions, Zero Deaths, Zero Delay, Zero Wear and Tear, etc.). The trends may not be moving fast enough. Certainly not each decision is optimal. These trends are the collective product of government decision-making, along with the decisions of hundreds of millions of travelers, vehicle makers, entrepreneurs, and so on. Trends that are favorable to transportation may be unfavorable to the economy (we are in part traveling less because fewer people are employed), but that is not the whole story. If we can make transportation more productive (do more with less), we can use those extra resources to do something we value more highly.